Welcome to Desert Gastroenterology Consultants, a medical practice located in Rancho Mirage, California. Our gastroenterologists specialize in the diagnosis and treatment of gastrointestinal and liver disease. We specialize in endoscopic procedures including colonoscopy, upper GI endoscopy and ERCP (a procedure to remove bile duct stones and help diagnose and treat pancreatic cancer). We have the latest in capsule Endoscopy technology, this is a specialized camera to look in the small intestine. Some of the more common diseases we diagnose, manage and treat are Crohn's disease, ulcerative colitis, gastroesophageal reflux disease (e.g. heartburn), hepatitis, pancreatitis and celiac sprue. 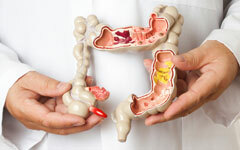 Colon cancer screening is the hallmark of our practice. Colonoscopy remains the gold standard to detect early colon cancer and prevent colon cancer by removing polyps prior to cancer formation. All of our physicians are Board certified in gastroenterology by the American Board of Internal Medicine and on staff exclusively at Eisenhower Medical Center. We perform outpatient procedure at the Mirage Endoscopy Center in Rancho Mirage certified by the prestigious Accreditation Association for Ambulatory Health Care (AAAHC).